Flowers are a big part of your wedding and can also be a big element in your wedding invitations. 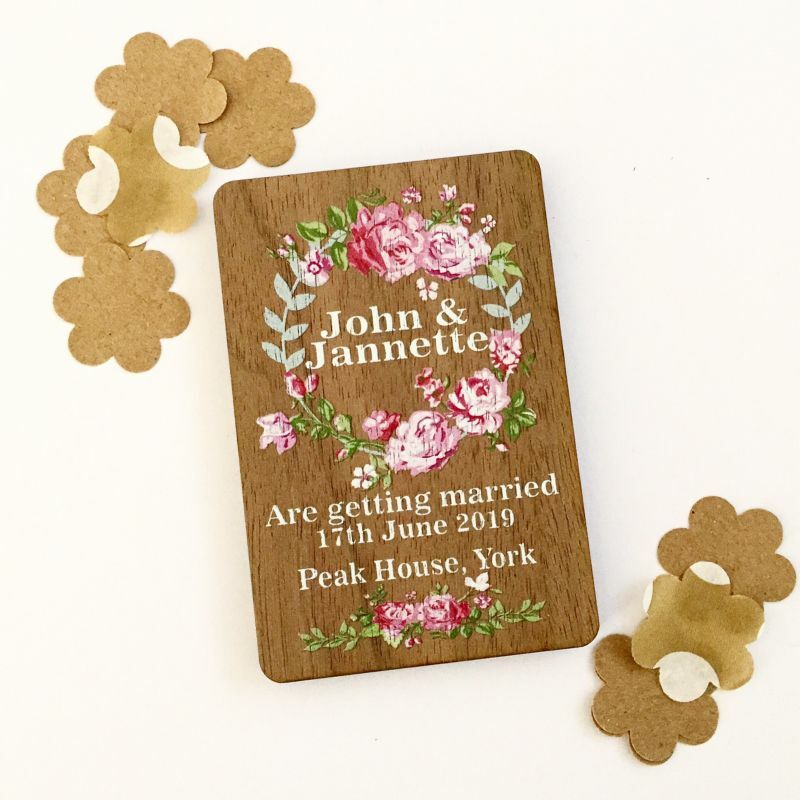 We have a wide range of rose wedding invitations and floral wedding invitations that include romantic flower designs such as roses and daisies. Emma is a stunning folded invitation featuring the couple’s names in an italic font underlined by 3 hearts and an arrow style line. The lower half of the design is complete with a floral pattern featuring Swarovski pearls and sparkling crystals, adding that extra touch of elegance and sophistication. Available in a choice of three colours. Supplied with envelopes. 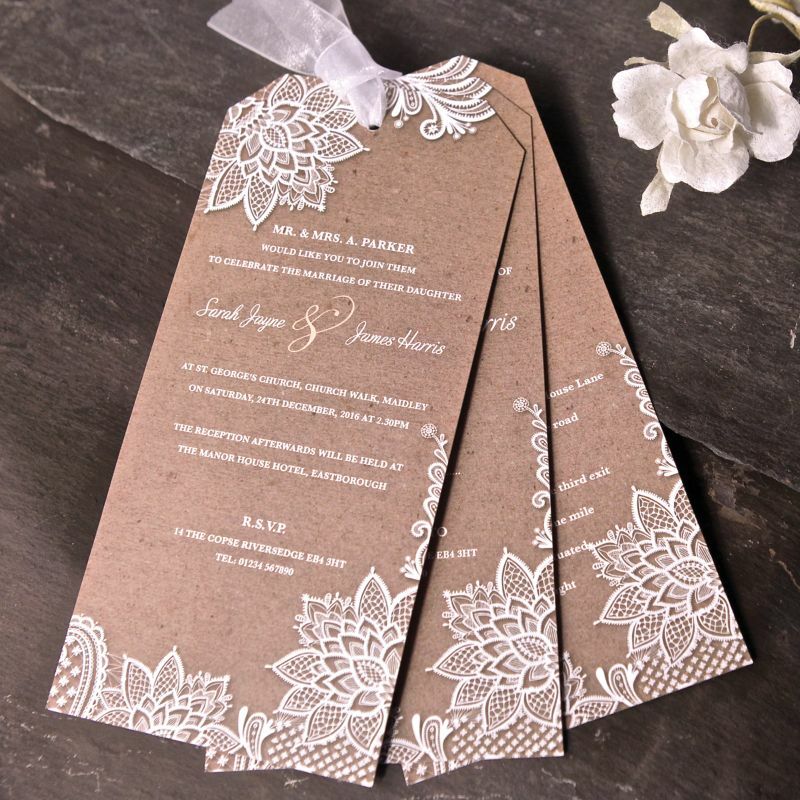 This gorgeous invitation’s intricate lace detail remains faithful to the traditional wedding design, whereas its sharp contrast to the rustic background make it an invitation that will stand out from the rest. It’s simple yet stunning design makes it ideal for most colour schemes as well as a great addition for both traditional and non-traditional weddings. Each invitation consists of your Day invitation, RSVP card and an information card. 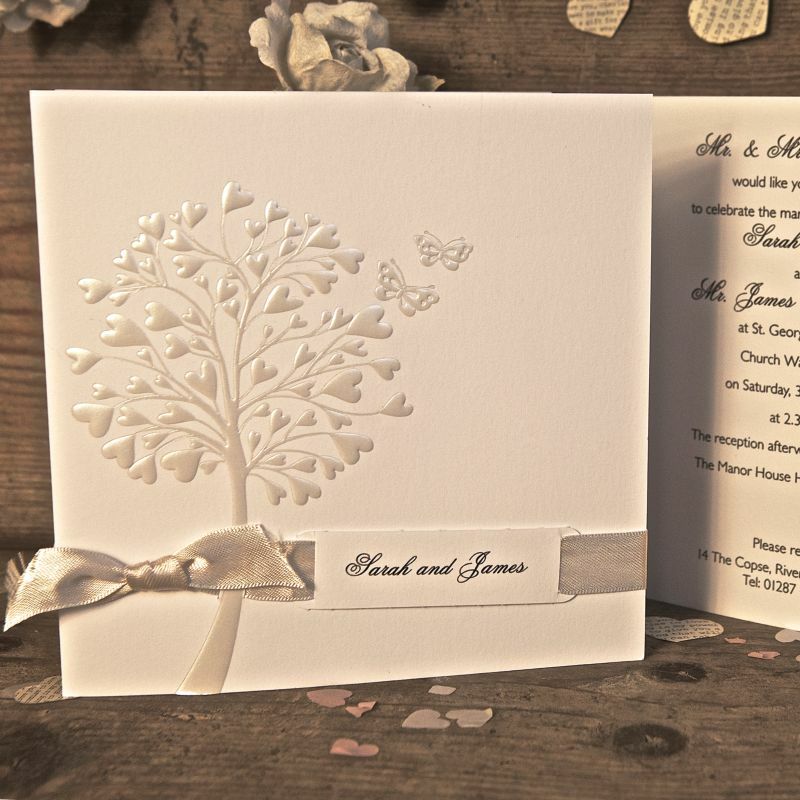 Embossed pearl foil hearts and butterflies have been used to create this simple design. A shimmering ribbon and personalised name tag pass over the front of the design. Whether you’re an earthy Goddess or garden-party Princess, the Jasper Day Invitation will suit your wedding style. The vintage-chic gatefold invitation design features a semi-transparent outer layer decorated with soft florals and topped with a double satin ribbon. 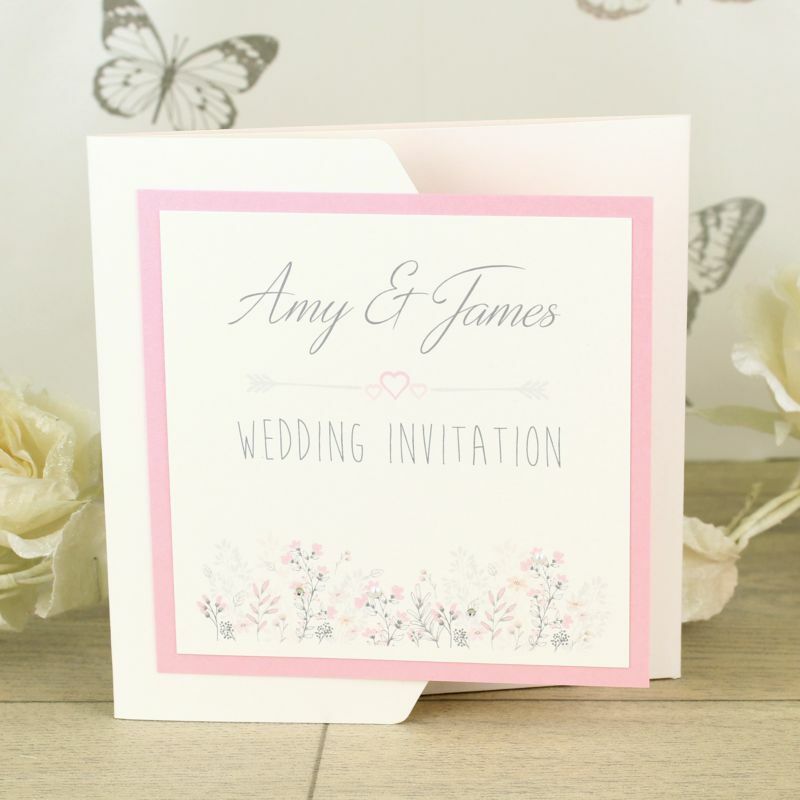 Go online to view a stunning range of wedding invitations. 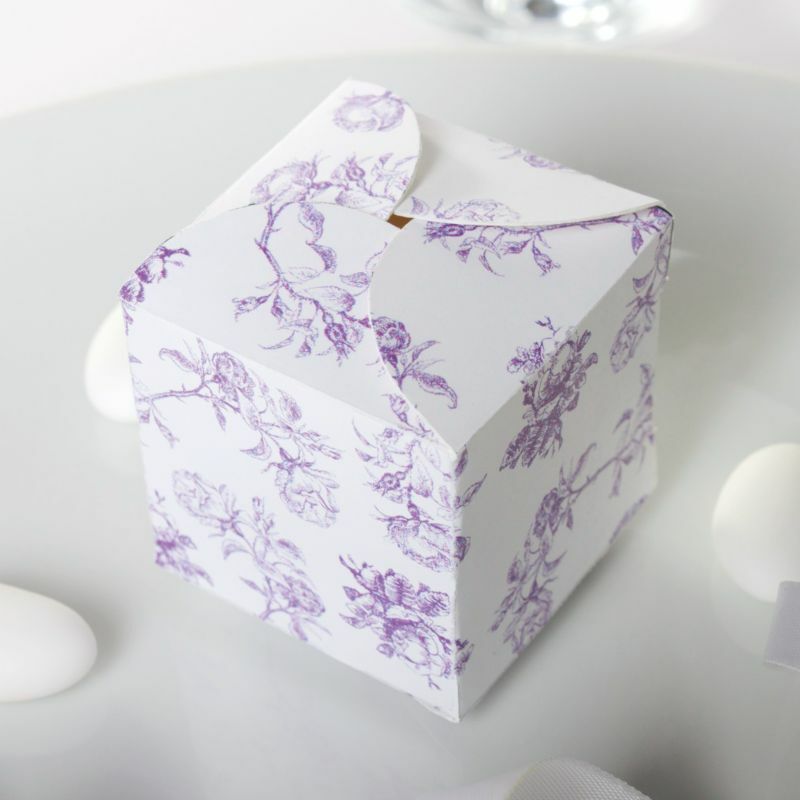 A little bit Jane Austen, a little bit Grace Kelly; The Bella Favour Boxes are a whole lot of vintage charm. The sweet floral theme hints at your guests’ takeaway inside while the quality makes it look hand-painted—well, you did assemble them! 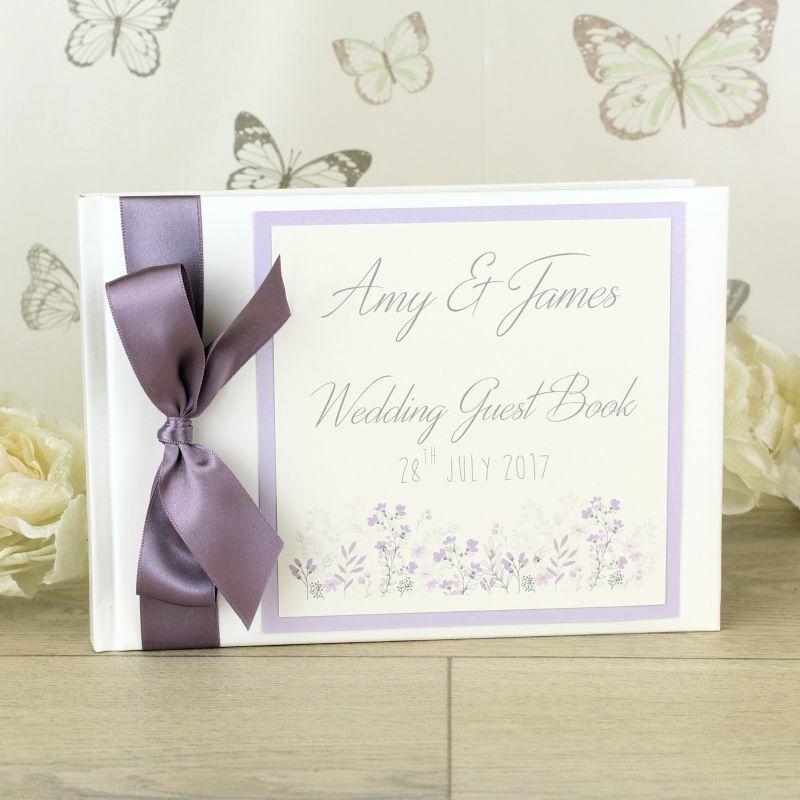 A stunning personalised guest book from our Emma range of wedding stationery and accessories. 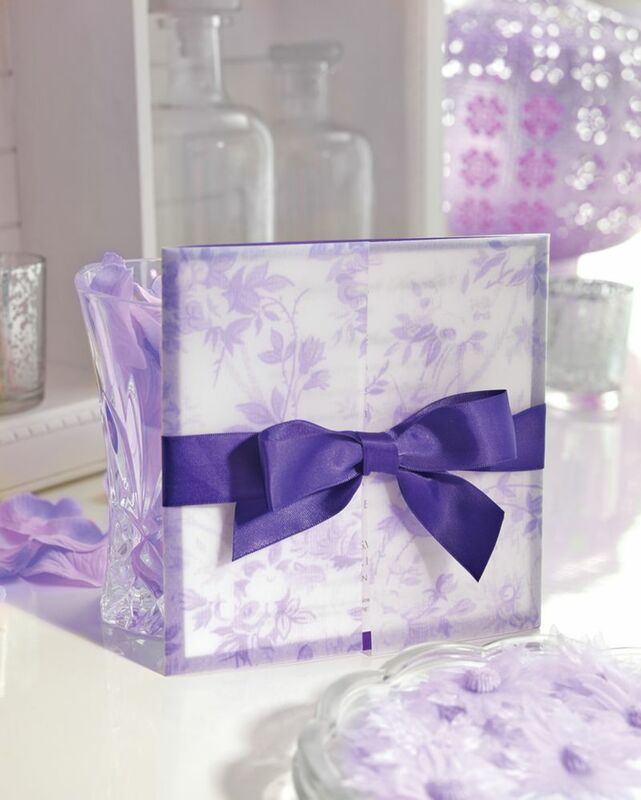 A lovely way for your guests to leave their comments and best wishes in for you to look back on in years to come. 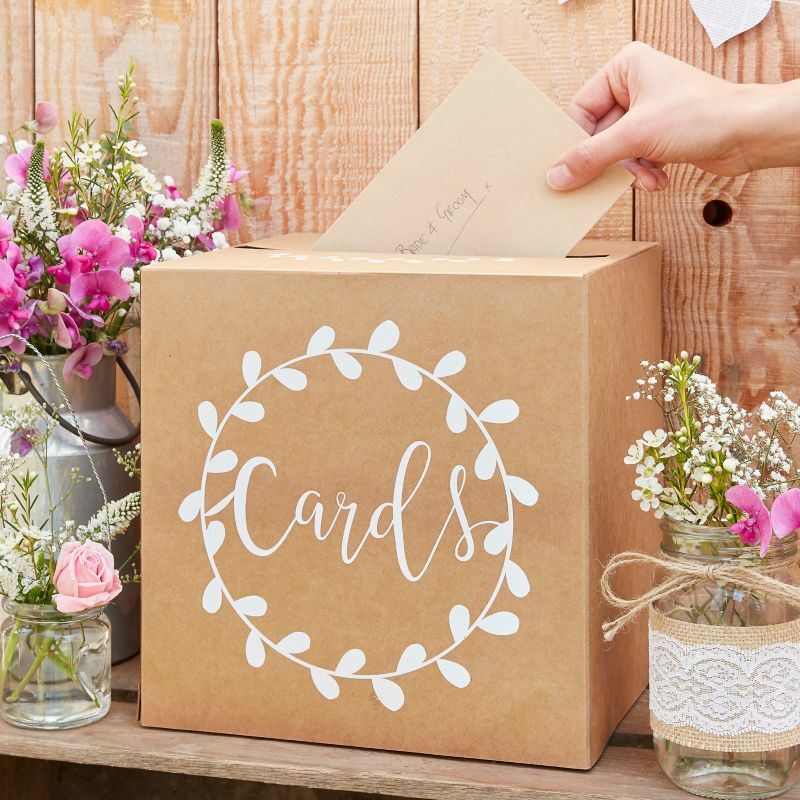 Make sure your guests know where to leave their lovely cards wity our Rustic Kraft Wedding Post Box. Finished with a crisp white and vine detailing it is sure to capture the eye of your guests. Each one of these Save the Date cards is cut from a walnut finished wood and then finished with a floral design. 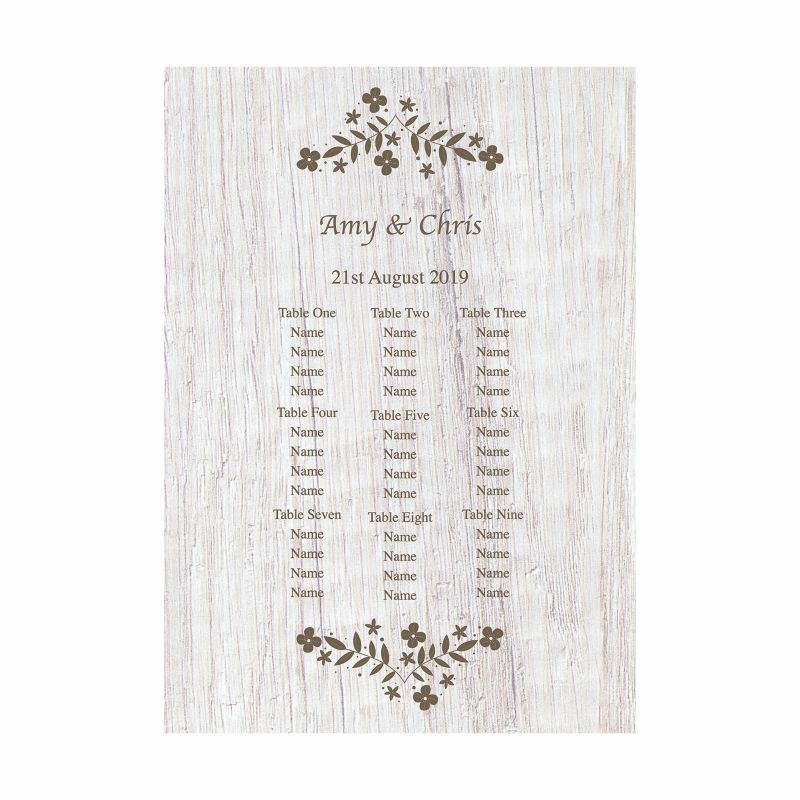 Your names, dates and wedding location is then personalised directly onto the front. Each tag measures 9cm x 6cm and is 4mm thick. Shop at Bride & Groom Direct for affordable wedding accessories. 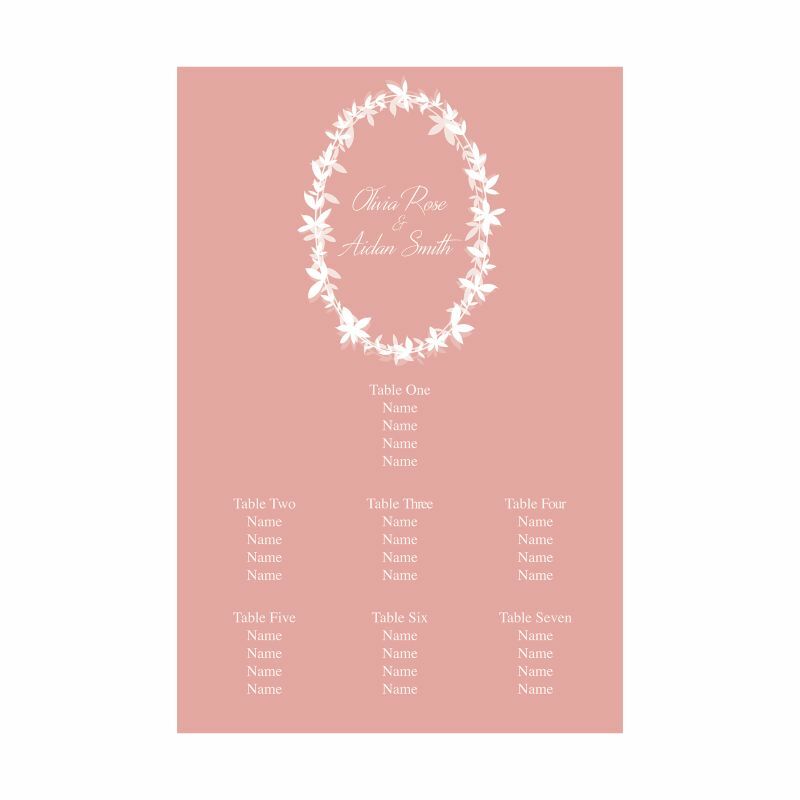 This Heidi table plan is a perfect match for the matching stationery range. Supplied with free table cards. A delicate vintage floral design features at the top and bottom of this Rosy table plan. Select from four colour ways – lilac, blue, mint green and pink – and simply upload your document to the site. Supplied with free table cards. 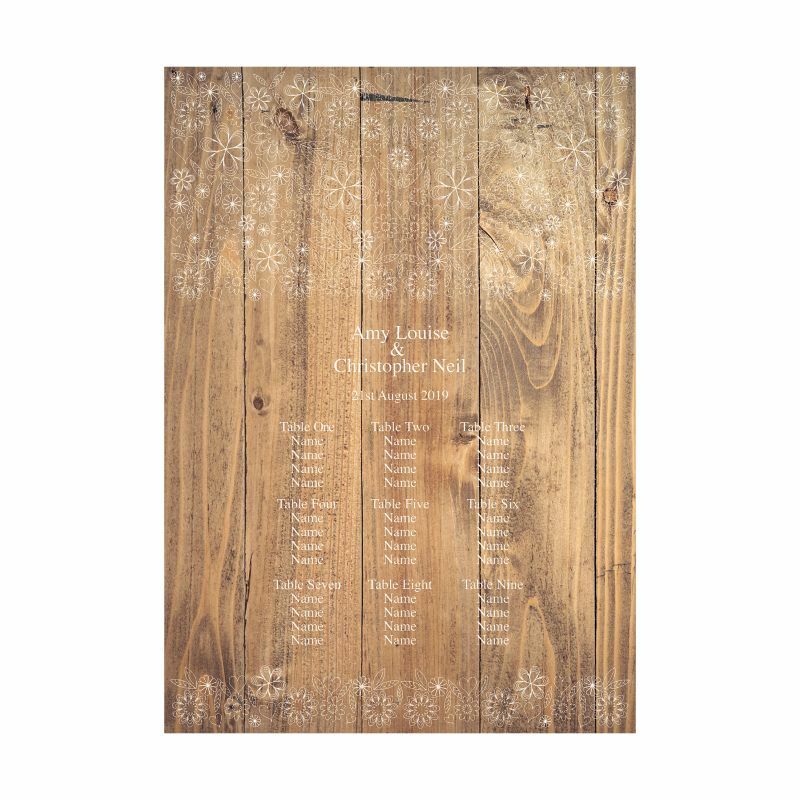 This Melanie table plan is a perfect match for the rustic themed wedding. Supplied with free table cards. A matching table plan which compliments our Isabella range perfectly. Your names are surrounded by a delicate floral boarder. Supplied with complimentary table cards which are personalised with your table numbers or names. 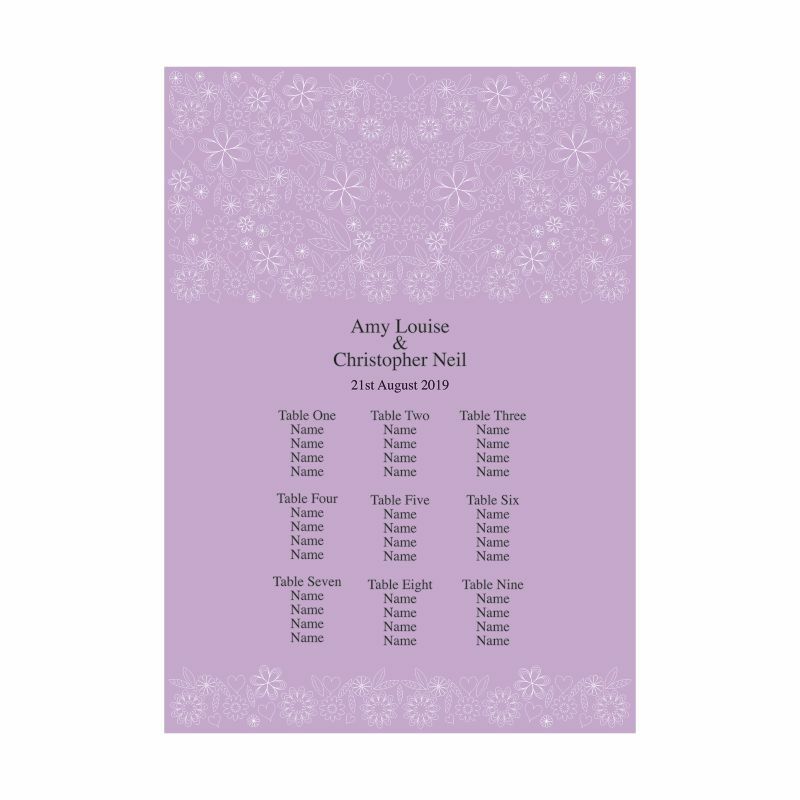 Browse wedding table plan kits online.